You may be among a growing number of Illinois parents who have heard of the 2013 Illinois Early Learning and Development Standards and Benchmarks (IELDS). Like many other parents, you may have questions about the IELDS. You may want to know how the IELDS might affect your preschooler’s education. You might also wonder what families can do at home that might help children meet the IELDS. What are the 2013 Illinois Early Learning and Development Standards? The Illinois Early Learning and Development Standards (IELDS) are designed to help teachers and caregivers plan educational experiences for young children that will help them be ready for kindergarten. The standards are broad statements that provide teachers with reasonable expectations for children’s development in the preschool years. A benchmark is a step on the way to meeting a goal appropriate for a particular age group. The benchmarks are essentially a list of things most young children should be able to learn, know, and do before they start kindergarten. The Illinois State Board of Education developed the IELDS with the cooperation of many early childhood educators and experts throughout Illinois. The IELDS are aligned with the Illinois Kindergarten Standards and the Common Core State Standards for Kindergarten. The Illinois Early Learning and Development Standards are also available in Spanish. Why do we need standards for children who aren’t even in kindergarten yet? The federal government requires each state to develop prekindergarten standards. The IELDS put into words what early childhood educators have always known about how children learn and how to get children started on a path toward lifelong learning. The IELDS are a set of guidelines that can help professionals in any program plan meaningful classroom activities to engage young children in learning. The IELDS give teachers and caregivers a way to think about what each child can already do and what they may need to learn to do to expand their knowledge and skills. For example, does Sam look at the pile of pennies and say, “One, two, seven, five,” or does he touch one coin at a time and meaningfully count each penny, “One, two, three”? How are the 2013 Illinois Early Learning and Development Standards organized? In each learning area, you will find at least one goal, at least one learning standard, and at least one benchmark. Most, but not all, learning standards have several Example Performance Descriptors. Each goal provides an overall objective about a specific area within a learning area. Each learning standard under a goal describes something children need to know or be able to do to meet that goal. Most standards have at least one benchmark. An early childhood benchmark describes something that a child needs to know or do to address the standard before kindergarten. Example Performance Descriptors give examples that describe small steps of progress that children may demonstrate as they reach preschool benchmarks. (e.g., “Did you remember to wash your hands?” and the child goes to the sink and washes hands). Respond to simple questions stated orally with appropriate actions and comments (e.g., “Did you remember to wash your hands?” and the child says “Oh, I forgot!” and goes to the sink and washes hands). (e.g., “I have a dog, too. His name is Champ.”). Make comments and ask questions that are related to the topic of the conversation or discussion (e.g., “I have a dog, too. His name is Champ. What’s your dog’s name?”). Here is what a section of the 2013 IELDS looks like. 1.A Demonstrate understanding through age-appropriate responses. Goal 1 is Demonstrate increasing competence in oral communication (listening and speaking). That means that throughout their schooling, students should be able to listen to, understand, and answer age-appropriate questions and directions. Even during preschool, children can learn listening and speaking skills that will help them be successful throughout their lives. Children who can express themselves clearly and listen well have a strong foundation to build upon when learning how to read and write. Learning Standard 1.A is Demonstrate understanding through age-appropriate responses. That means that throughout their schooling, students should respond in age-appropriate ways to oral directions and questions. Students should be able to provide comments that relate to a group discussion or conversation. Students should also have an understanding of emotions based upon a person’s facial expressions and body language. Preschool age children can begin to follow simple directions and respond to others’ emotions and questions during daily routines and activities. Can parents use the standards and benchmarks? As a parent, you might use the 2013 IELDS in several ways. For example, reading the benchmarks can give you an idea of the kinds of skills and experiences that kindergarten teachers would like every child, including yours, to have before entering kindergarten. You can also find out whether your child’s program uses the IELDS. If it does, you might ask the teacher which benchmarks your child is working on. The teacher will be able to tell you how the classroom activities help the children meet benchmarks. Families can also work together with early childhood programs to provide learning experiences for their children. 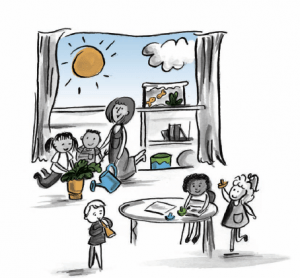 So, you might use the 2013 IELDS to help you think of things to do at home that might give your child the skills and knowledge he or she will need for kindergarten. Click on the underlined number of any benchmark to link to a list of Web articles. Find a title that interests you. Then click on the underlined Web address to link directly to the article. When your 4-year-old says, “I’m in my car seat,” she shows that she is gaining an understanding of location (Mathematics Benchmark 9.B.ECa). During the drive, your 4-year-old may notice a billboard with the logo of her favorite sports team. “Look, Mom, the Cubs!” she shouts. That’s a clue that she connects the team’s symbol with the team itself. In other words, she recognizes common signs and labels in the environment (Language Arts Benchmark 4.D.ECa). When your child asks “Are we almost there?” she is beginning to express geographic thinking (Social Studies Benchmark 17.A.ECb). While shopping, your child may say he wants both cookies and yogurt. You might reply, “We don’t have enough money for both, but you can choose one.” When he answers, “Okay, yogurt,” he shows that he is beginning to understand that money and resources are limited (Social Studies Benchmark 15.B.ECa). When a child reminds you that “apples are good for you,” she is beginning to identify healthy habits (Physical Development and Health Benchmark 23.B.ECa). As a child realizes he can’t get his favorite treats if he misbehaves at the store, he is beginning to understand the consequences of his behavior (Social/Emotional Development Benchmark 30.A.ECf). Keep in mind that your child grows and learns at his or her own pace. Children will meet 2013 Illinois Early Learning and Development benchmarks at different times. Even within your family, your children will probably not meet every benchmark at the same age. How will the 2013 Illinois Early Learning and Development Standards affect my child? Does your child attend a program that receives Early Childhood Block Grant funding? By law, its comprehensive services must be aligned with the IELDS. Some curricula used in early care and education settings have been aligned to the IELDS (see ExceleRate Illinois). A wide range of experiences and activities can be used to help children achieve the benchmarks. For example, a preschool teacher would want to provide classroom experiences that help children notice the differences between letters and numbers (Benchmark 4.A.ECf). The teacher might make name tags for children’s cubbies so they can begin to see what letters are in their names. She might make sure to include a set of toy road signs in the block corner and place a 0–10 number chart on the wall where children can easily see and comment on it. What are some important things to know about the 2013 Illinois Early Learning and Development Standards? The IELDS were developed by a group of people with many years of experience in teaching young children. The standards are meant to recognize the needs of “the whole child.” That means they are built upon the idea that knowledge and skills in one learning area affect knowledge and skills in other areas. 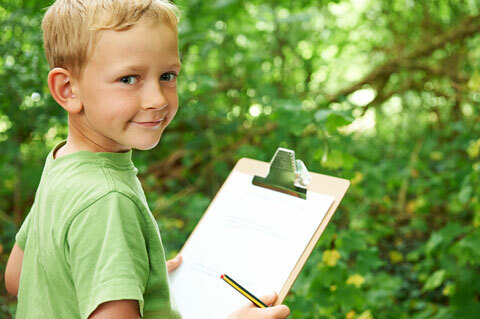 The IELDS allow for a balance of child-initiated and teacher-initiated learning experiences. They take into account the fact that children develop at different rates. The IELDS were field tested in many classrooms throughout the state before the Illinois State Board of Education adopted them. Many preschool activities address more than one benchmark at a time. Teachers do not need to come up with a separate activity for each benchmark. For example, when Tamika’s class studied turtles, Tamika met some science and arts benchmarks by observing a box turtle and making sketches of it. Tamika also met language arts benchmarks when she told her classmates about what happened when she fed a worm to the turtle. Some kinds of play also enable children to meet more than one benchmark at a time. After Tamika’s class took the turtle to a veterinarian for a check-up, several children worked together to build a pet hospital using blocks and toy animals. They also took turns acting as the doctors and pet owners. When doing all this, they were meeting benchmarks in social studies and social/emotional development. How will a teacher know if my child is meeting the 2013 IELDS benchmarks? A teacher may be able to tell whether a child has met some of the benchmarks simply by watching or talking to the child. For instance, if Sarah is able to express ideas using paints, pencils, and clay, her teacher will know that she meets one of the arts benchmarks. If you visit a program that uses the 2013 Illinois Early Learning and Development Standards, you might see the benchmarks posted in the hallway, the office, or the classrooms. The teachers will probably collect children’s work that shows they are meeting benchmarks. A teacher might keep a folder for each child so parents can see during conferences how their children are doing in school. For example, to show 3½-year-old Amaya’s parents what their daughter is learning about language arts, the teacher hands them some samples of Amaya’s work. One item is a folded page covered with scribbles and two backward “E”s that Amaya called “My Newspaper.” Another is a photograph of Amaya holding a book open, turning pages while telling the story to her friend. The teacher explains that the “newspaper” shows that Amaya experiments with writing materials (Benchmark 5.A.ECa) and that she is beginning to “write” by making scribbles and trying to form letters herself (Benchmark 5.A.ECb). The photograph shows that Amaya understands how to use books (Benchmark 2.A.ECa). Together, the two samples show that Amaya interacts with a variety of texts or written work, such as her “newspaper” and a storybook (Benchmark 2.C.ECa). In Illinois, preschools may use various methods to measure children’s growth and development. Talk to your child’s teacher about how she measures your child’s learning and development.